Cake originally made for the Princess in May 2010. Please forgive me for, once again, having pictures mostly taken at night. I have to do the cakes after work and after the girls go to bed. 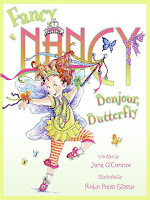 Have you heard of Fancy Nancy? If you have a young daughter, chances are you have. If you haven't Fancy Nancy is a precocious little girl who likes everything fancy. Very fancy. She comes from a series of books by Jane O'Connor and illustrator Robin Preiss Glasser. Really, just do a Google search and you will find tons of stuff. 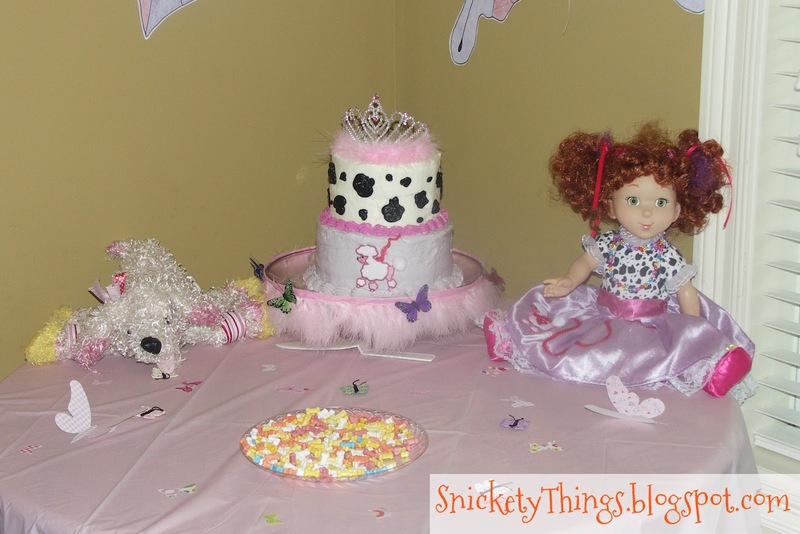 By the time my oldest was turning five, she wanted nothing more than to have a Fancy Nancy birthday party. Online searches for Fancy Nancy parties bring you all kinds of fancy dress and tea parties aimed mainly at little girls, along with an over the top decorated cake complete with colored ostrich feathers and jewels. My daughter didn't want a party quite that over the top because she wanted boys to come to the party, too. I didn't want to make a cake completely covered in non edible items. Don't get me wrong, I don't mind putting toys and other things on a cake, just not completely covering it. We had just read Fancy Nancy Bonjour Butterfly and Fancy Nancy and the Posh Puppy so she decided those two books would be the basis of the party. For Christmas she had gotten a Fancy Nancy doll from her grandmother. 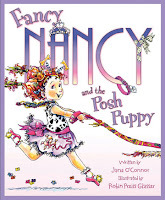 This is Nancy in the outfit she wears in Fancy Nancy and the Posh Puppy. Since I had made the Snow White cake to look like a dress, she asked me if I could make her Fancy Nancy cake look like the dress on her doll. That I thought I could do. I made two six inch cakes and two eight inch cakes and stacked each set together. The six inch rounds were iced in white and the eight inch rounds were iced in a light purple and then stacked. I piped a shell order at the bottom in the light purple and around the middle in a bright pink to match the ribbon on her dress. Using my trusty tube of Wilton black icing I piped the black cow spots with a Wilton #6 tip. Did you see how well I replicated the poodle? Just kidding, I bought the smallest poodle iron-on Hobby Lobby had. 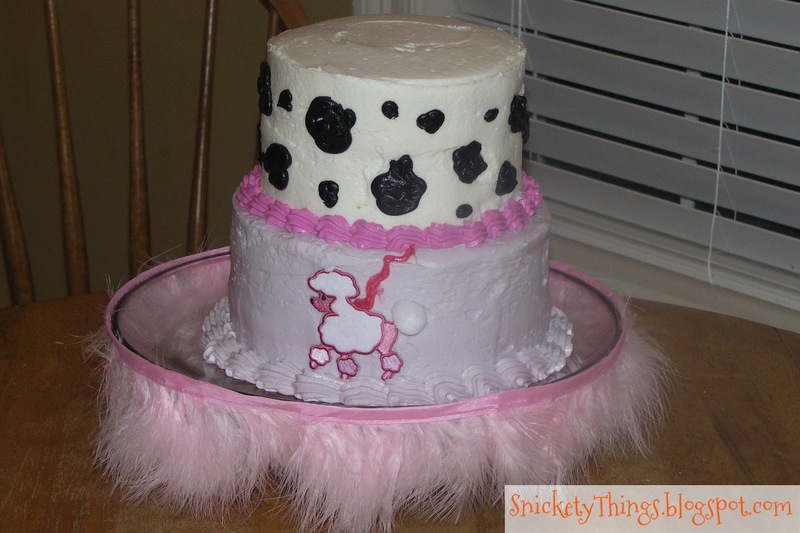 I completely covered the back of the poodle with plastic wrap and tape so the glue would not seep in to the icing. The leash is from a tube of Wilton sparkle gel that I had left over from Easter earlier that year. Did you notice the edge of the cake plate? I bought a package of stick on feather trim and ran it around the edge. It lacked one inch completely going around so I deftly hid that space in the back. 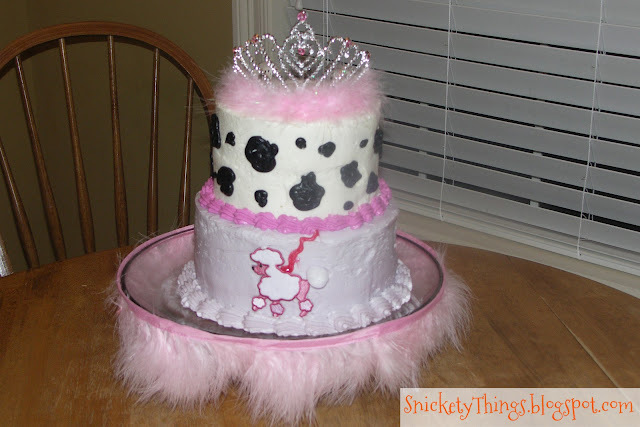 I topped it off with a fancy tiara that matched the pink feathers on the cake plate. Since the cake was mainly from the puppy book, I worked some butterflies onto the cake plate the next morning to tie both books to the cake. Here is the cake at the final set up. On the left you can see Nancy's dog, Frenchy. 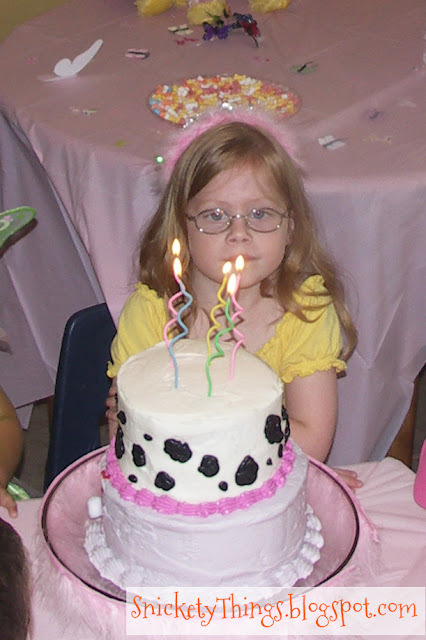 When it was time to blow out the candles, the tiara was placed on the birthday girl's head. I used pastel swirly candles. Please do not pin this picture. If you look on the right of the cake stand, just above the word spot in the stamp, you will see where the feather trim left that gap I was telling you about. If you have any questions about something I did please ask! Come back tomorrow for a Fancy Nancy encore. This cake was featured at Everyday Mom Cakes. What a cute cake. My Aunt Nancy is just like her and when I first saw one of the books I thought of her and fell in love with her. I'm sure your little fancy Nancy had a great day! Keep up the good work, mom! Thank you! I bey my daughter would love to meet your Aunt. Found your blog via the Blog Hop. I’m your newest GFC follower! Thank you! I will return the favor. Oh my heavens, I love it! Fancy Nancy is something I will force my daughter to love just becaues it's so stinking cute and the vocabulary is fabulous. I know you already shared at Whimsy Wednesday, but you have to come back over and share this! I love it! I'm glad you like it so much. I have added it to Whimsy Wednesday. Thank you so much for joining in! The birthday girl is so cute! Cute cake! 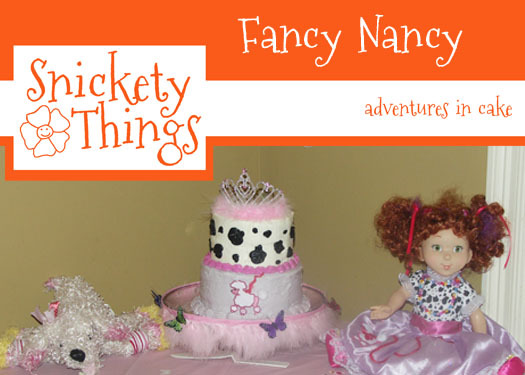 A Fancy Nancy party is a brilliant idea. I bet my daughter would love that. I'll have to suggest it. Thanks. Thank you! 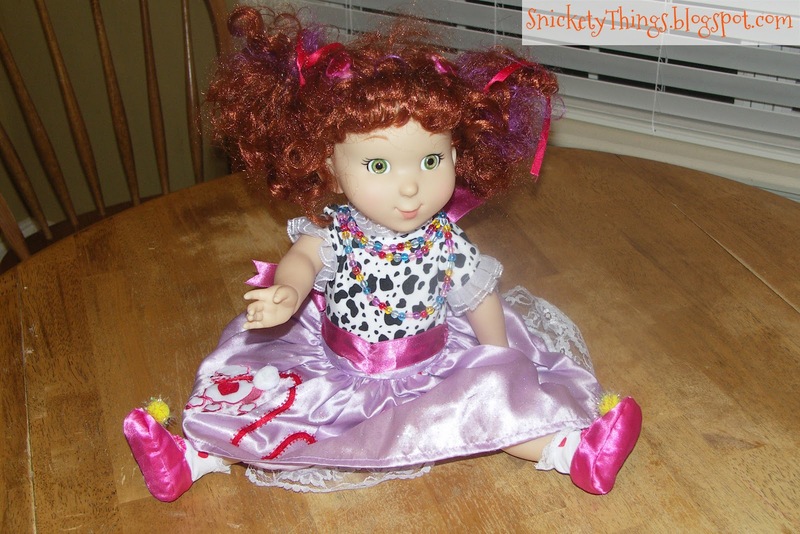 We attended four Fancy Nancy parties that year so it was a popular theme. I am blown away by the talent some (including you!) have when it comes to decorating cakes. I am lucky if I can just get a couple layers put together and frosted without them collapsing. lol You did a great job. I love the way you tied in the theme without it being over the top. Thank you so much! I am going to have to post some of my dismal failures. Thank you! Fancy Nancy is great for adjectives. My daughters were both using the big Fancy Nancy words to describe things when they were just three. Love it! I think the way you make cakes like dresses is fantastic. Thank you! Making them look like dresses is a little easier I've learned. I'm all about ease. How adorable! My daughter would love this! I would love for you to consider submitting this over at Everyday Mom Cakes for a feature (look on the Nav bar for how to submit) and also to link up any other desserts on the dessert hop that starts tonight (6pm AZ time). Thank you! I will have a look at your link party. Absolutely beautiful! Thanks for sharing at Shine on Friday!! Very cute cake! Any little girl would love it even if they weren't familiar with the books! Very cute and very adorable cake! Very impressed with your creativity! Luck girl to have you. You have a fun blog - I just found it. So cute! Thanks for linking to Handmade Tuesdays. I know it's just a matter if time before my daughter is into Fancy Nancy. What a great cake! I am in awe. I've tried decorating fancier cakes for my son's birthdays but they just never turn out quite how I'd like. maybe I'm too hard on myself..but for sure I know I need more practice! Thanks so much for sharing at Scrumptious Sunday! Thank you, but I will let you know that my finished cake hardly ever looks like what I intended. 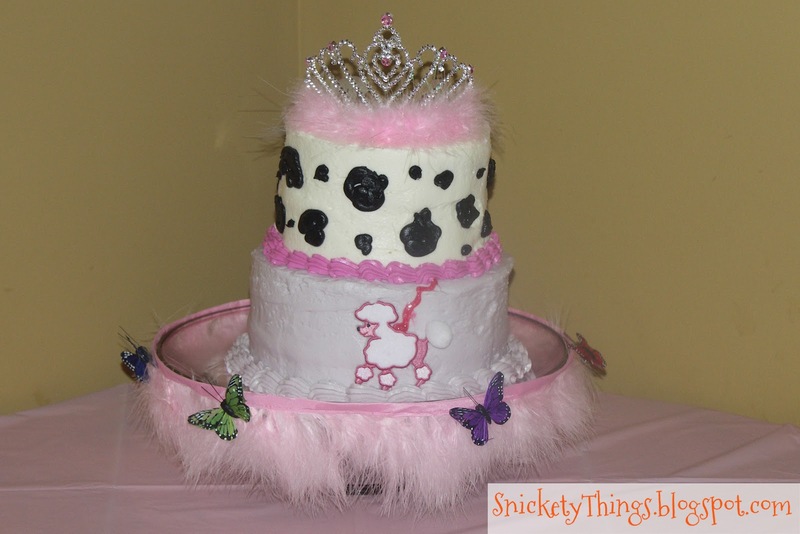 I had not heard of fancy nancy, but the cake is very cute! Werll done! Your cake is just amazing. Great job. I am your latest follower. Thanks for sharing at DIYbyDesign. That is super pretty!!! Love it! I have seen the Fancy Nancy books while working at Target. Cake looks great. Thank gor linking up to Show your Stuff. Thank you! Those are cute little books. Ah, I love Nancy AND this adorable cake! Thanks so much for linking up on Fabulous Friday. See you again next weekend!